It’s not uncommon to walk into my house and find a big bowl of popcorn on the counter. It’s sort of my go-to snack and a few days a week I’ll make a big batch and just leave it around for easy access. 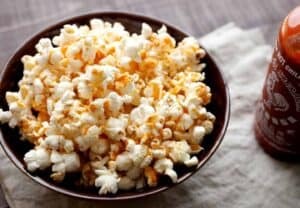 The truth is that normal, plain, air popped popcorn is one of the healthier snacks you could make. Of course, this version is a bit enhanced with brown butter, but it’s totally worth it. If you’re a popcorn lover, you just have to try this. It has a little sweetness to it, almost like kettle corn, but then a spicy kick at the end thanks to everybody’s favorite rooster sauce! Possibly the most addictive popcorn I’ve ever had. Slightly sweet with a hint of brown butter and just enough spice. 1) Pop popcorn in an air popper. You can also pop it on the stovetop if you prefer that method. 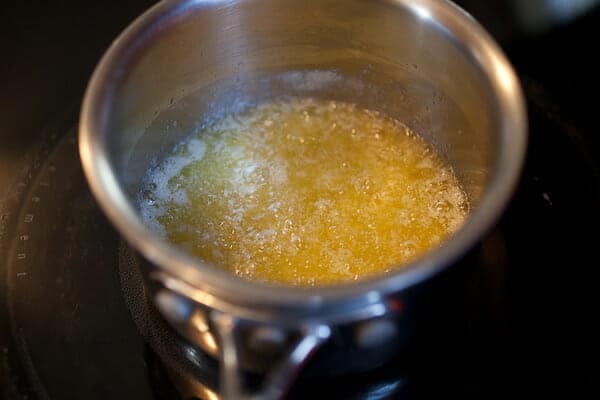 2) For sauce, add butter to a small pot over low heat. 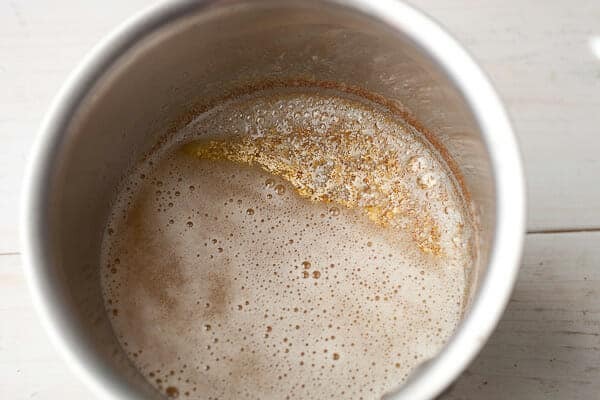 Melt and continue to let cook until the butter foams, then clears, and you notice tiny brown bits on the bottom. It should smell nutty. Remove it from the heat immediately so it doesn’t burn. It should take 5-6 minutes for this process to happen, but the final time depends on pot and temperature. 3) Vigorously stir in brown sugar and sriracha and drizzle popcorn with sauce. The sauce might separate a bit if you let it sit so stir it well before drizzling. Also season popcorn with salt if needed. Let’s deal with the popcorn. These days I’m a huge fan of the air popper. If you are popcorn lover, please do yourself a favor and grab one of these. 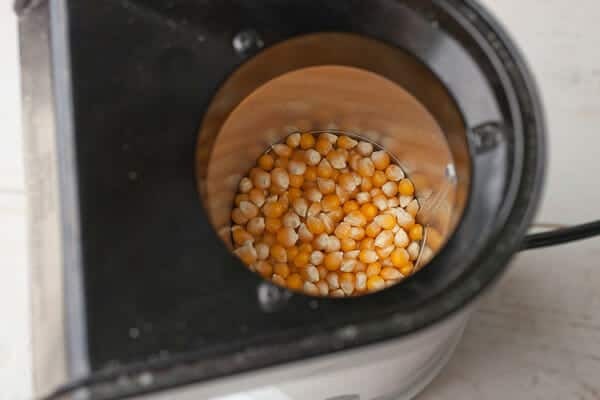 They are relatively cheap and use nothing but air to pop the popcorn, unlike the stovetop method where you need to add oil. 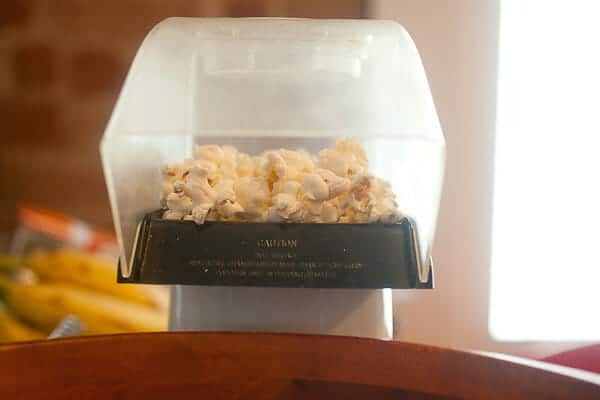 Just add your kernels to the popper and crank it up. 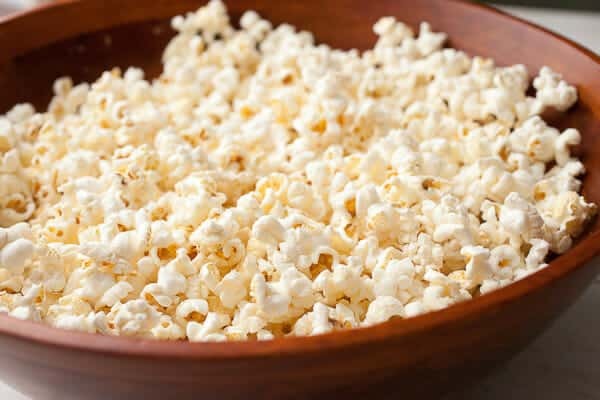 After a few minutes, perfectly fluffy popcorn will come pouring out! The nice thing about air-popped popcorn is that it has zero add-ins. It’s like a blank snack slate. You can do tons of stuff with it at this point! Speaking of… let’s add possibly the most addictive snack sauce I’ve ever made to our perfect popcorn. 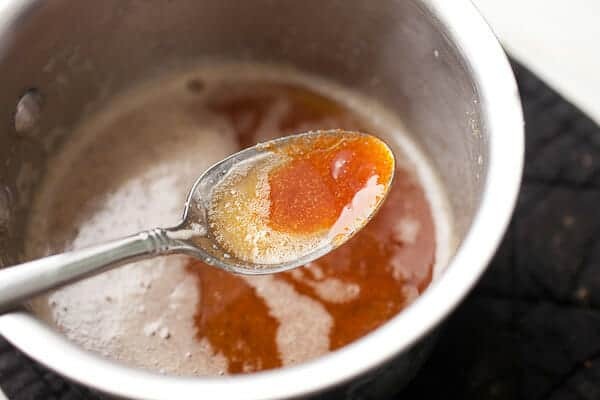 Browned butter is really easy to make. Don’t be afraid of it. 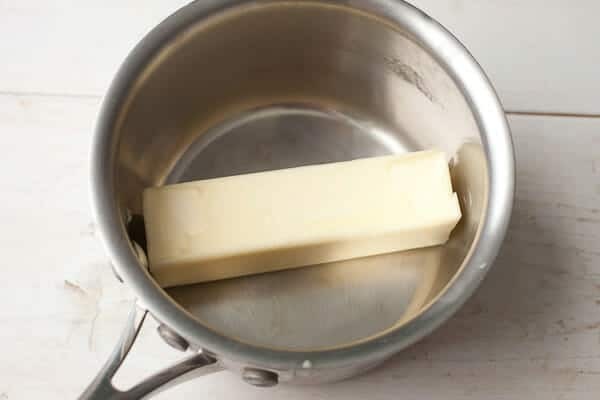 Just melt the butter in a small pot over low heat. It should kind of foam and then the foam will sink. Don’t worry about stirring it or anything. Just let it slowly simmer. After a few minutes, check the butter by tilting the pan and you should see that there are a bunch of browned specks on the bottom. The butter will also smell really nutty and delicious at this point. Remove it from the heat so it doesn’t burn! Congratulations. You just made brown butter. Once your butter is done, stir in some brown sugar and all that lovely sriracha sauce. Start with one tablespoon, but I upped it to two immediately because I wanted it spicier! If you stir this sauce it will combine, but if you let it sit, it will separate a bit. No big deal. Just make sure to vigorously stir it before you drizzle it over the popcorn. Don’t be shy with this stuff. Drizzle like crazy over popcorn. The popcorn might also need a big pinch of salt. 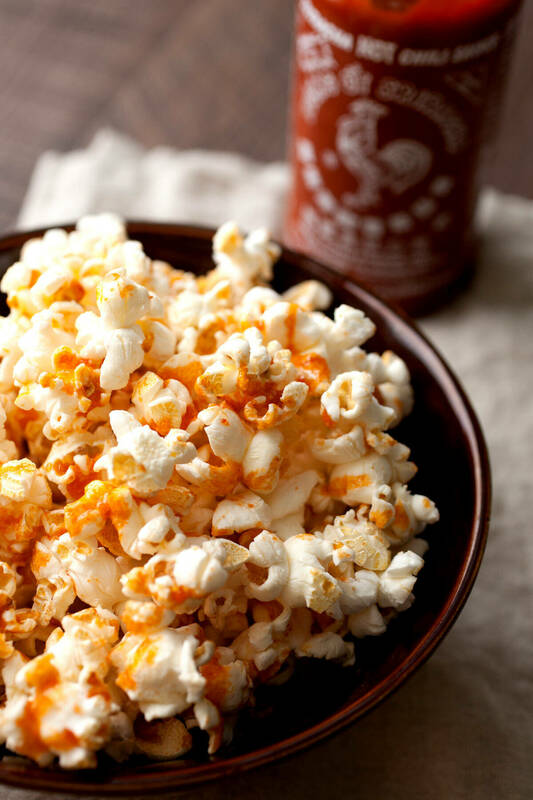 Man, this brown butter sriracha popcorn is really addictive. It was impossible for me to walk by this bowl and not grab a handful! Holy cow, this is good! I made it as a snack but it is now my lunch. You are very right about how addictive is. Thanks for putting together some of my favorite flavors!